A colleague of mines Derek Wade modified Richard Ding’s sp_SDS stored procedure to work with SQL Server 2008 R2 & SQL Server 2012. You can run the original stored procedure on SQL Server 2008 R2 however the report would be blank because there is version information in query for SQL Server 2008 R2 and this version information is expected. This version information has been updated to include SQL Server 2008 R2 & SQL Server 2012. 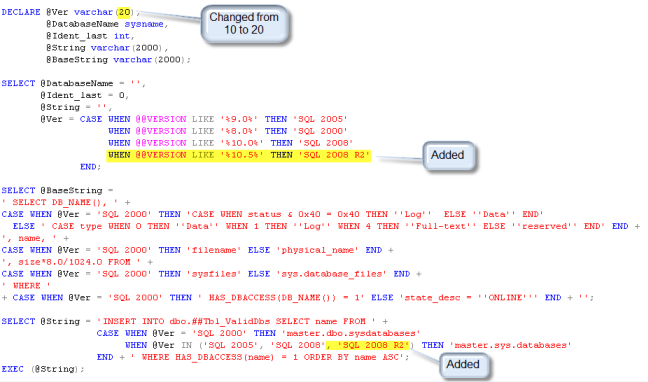 The following changes were made to the stored procedure so it can support SQL Server R2. @Level varchar(10) = 'Database',       --  or "File"
This entry was posted on Monday, December 19th, 2011 at 4:23 pm and is filed under SQL Server 2008, SQL Server 2008 R2, SQL Server 2012. You can follow any responses to this entry through the RSS 2.0 feed. You can leave a response, or trackback from your own site.